Dr. Anas Gremida, MD, is a gastroenterology and hepatology fellow at the University of New Mexico. His research has focused on colonoscopy techniques and on improving immunizations among inflammatory bowel disease patients. In addition to an impressive publication record in medical journals, he is distinguished among his colleagues, winning multiple prestigious awards including the SSM Mission in Motion Award, the Young Achiever Award from American College of Physicians, Exceptional Performance Award from Saint Louis University Hospital for best teaching and exceptional patient care. Dr. Gremida is committed to advancing his medical training with the ultimate goal of giving back to his community. He cofounded and the Libyan Organ Transplant Education Program and has ongoing involvement with the Libyan Healthcare Society-USA. Dr. Gremida has arranged free health care visits to local health care centers in his home town in Zawia City, Libya, with the goal to help those who are underserved and who cannot afford private health care. He has seen many patients and returns regularly to provide care and arranges consultations for others in the United States. 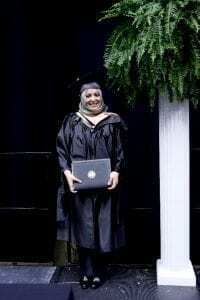 Dr. Awatef Ben Ramadan was licensed as a medical doctor in Libya and is currently completing a PhD in Health Informatics at the University of Miss ouri. Awatef has made contributions to society in Libya and to the cancer surveillance and public health community in Missouri and beyond. Her early published research estimated the incidence and prevalence of tuberculosis in Libya in 2005, which is notable as the last estimated rates had not been updated since 1977. Since then, she has published a number of scientific papers and has participated in many national and local conferences and meetings. In addition to excelling in her studies, she balances the responsibilities of her academic work, volunteering on campus and in the local community, and of family life with her husband and four children. Awatef acknowledges the need for public health scientists in Libya and is passionate about her plans to take an active role in helping to rebuild the country and to educate and protect Libya’s vulnerable people. 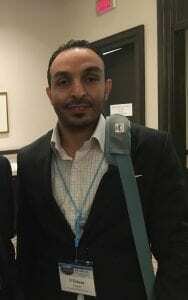 Mohamed El Badawe is a PhD candidate in Electrical and Computer Engineering at the University of Waterloo. When he was awarded his scholarship through the Libyan-North American Scholarship Program, Mohamed decided focus his research on enabling communities to better utilize their resources and develop a renewable energy source to replace Libya’s dependence on fossil fuels. Mohamed has received many awards and holds a p atent for a metasurface antenna used to harness energy from the electromagnetic spectrum which includes solar energy. This device has been designed, fabricated and tested, and results were published in highly ranked journals and presented in several conferences. In addition to his strong academics, Mohamed’s social consciousness and engagement with the broader community are exemplary. He has held a number of positions on campus, including his current role as President of the Electrical and Computer Engineering Department Graduate Student Association, and is engaged in the broader community welcoming Syrian refugees and organizing activities for Syrian refugee children in Waterloo. Mohamed Zidan is in the third-year of his Bachelor of Engineering Communications program at Carleton University. 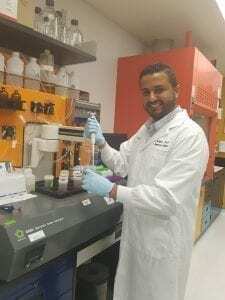 Currently, he is considered one of the top and strongest students out of 4000 students in the entire Faculty of Engineering at Carleton University. Based on these achievements, Mohamed was placed o n the 2015/2016 Dean’s List. He was also one of the top 10 high school students in 2012 in Libya. In 2013, he received the scientific excellence award granted by Libyan student Union and National Assembly for Outstanding and Talented Students. In addition, Mohamed won two In-course scholarships given by the awards office at Carleton University. 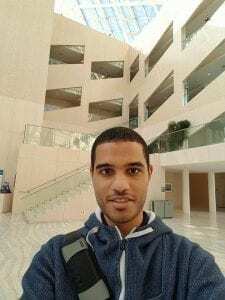 Mohamed is an active volunteer in the community and is the founder and administrator of the “Undergraduate Libyan Students in Canada” Facebook Group, which seeks to support and advise undergraduate Libyan students in Canada. 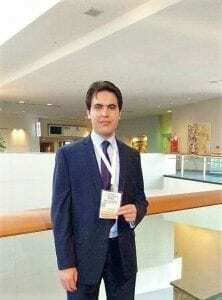 He is likewise the founder and administrator of the “Libya after Oil and Current Crisis” Facebook Group, which has the goal of creating a long-term plan for Libya 2035. Mohamed has strong intellectual abilities and an honest enthusiasm for learning and giving back to his community. Rasem El-Fahkhri has a bachelor degree in Public Health from the University of Benghazi. During his undergraduate study, he conducted research abo ut the Healthy Eating Index at the University of Benghazi. Recently this research was published in a scientific book in English about the public health in Libya. Currently, he is a master’s degree student in Human Health and Nutritional Sciences at the University of Guelph. His research project was sponsored by Agriculture and Agri-food Canada, Health Canada, and the University of Guelph. It is expected that application of the method he developed through this research project will help individuals with diabetes and obesity to have better control of their health. As a philanthropist, Rasem was a founding member of “Youth Make an Impression,” a volunteer group that sought donations of financial and basic life necessities to assist persons displaced by the Libyan Revolution. Also, he made a commitment to increase social consciousness through volunteering in different programs in the local community of Guelph, including the Rotary Club, Guelph Food Bank, ESL Buddy Program. 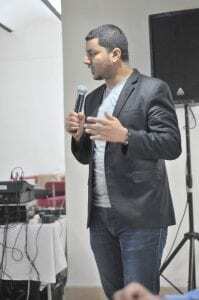 Furthermore, he is a member of the Canadian Nutrition Society, Libyan Nutrition Association, and the Arab and the Muslim Students Association. Faraj Aljarih is pursuing his Master’s in Teaching English to Speakers of Other Languages at Washington State University. He has presented in many scientific conferences in the field of Computer Assessed Language Learning (CALL), such as Gonzaga Conference, WSU Tech, and TESOL Conference 2016. Faraj is also a professional journalist and has published many articles about current events in local, regional, and international news agencies. During his time in the US, Faraj has also conducted presentations about Libya and its cultural heritage and has contributed to spreading mutual understanding between cultures and enforcing the ties between US and Libyan NGOs. Faraj was recently elected as a Senator at the Graduate & Professional Students Association, which is the representative body for graduate and professional students at Washington State University. Currently, Faraj is doing his research on the effective use of educational technology by evaluating the educational technologies use at Washington State University. Winners may be invited to co-present a session or poster session at the Annual Conference and will be featured on CBIE’s website, at CBIE’s Annual Conference, and in all related communications support that could include social/traditional media and email campaigns. In addition, all accepted nominees will receive a certificate of appreciation from CBIE. Preference will be given to those students who have contributed positively towards building their country or made a positive impact on Libyan society, as well as those who have fostered positive relations between Canada/Libya and/or the US/Libya. The nomination period opens on Monday, August 22, 2016. Nominations should be submitted by downloading the nomination form and sending the form along all other supporting materials to libya@cbie.ca. Nominations must be submitted by close of business day on Friday, September 16, 2016 to be considered. A Selection panel comprising three CBIE employees, one professional member from our academic institution partners, and a prominent Libyan scholar/leader will assess nominations to determine the winners. The winners will be announced and presented with a plaque and certificate at a ceremony during CBIE’s Annual Conference from November 13-16, 2016. Winners will be individually notified and may be publicly announced in advance of the ceremony. Please note that winners are required to provide a 2 minute introductory video to be presented at the CBIE’s 50th Annual Conference if the student is not able to attend and receive the award in person. By submitting the award application documents, the nominee agrees to be bound by these terms and conditions, regardless of whether the nomination form is fully completed, signed or not. The terms and conditions of this award are governed by the laws of Ontario, Canada. Nomination is limited to Libyan citizens sponsored by the Libyan Government under the Libyan-North American Scholarship Program (LNASP) who complete all nomination requirements. Any application which is found to be partially or fully incomplete, non-compliant with the awards criteria, illegible or otherwise substantially deficient, or which is submitted after the closing date and time, may be withdrawn from consideration, without notice and at the sole discretion of CBIE. The applicant confirms that all information provided is true and accurate. Any application containing false or misleading information may be withdrawn from consideration, without notice and at the sole discretion of CBIE. The nominee grants permission to CBIE to have their photograph taken and/or be filmed, without prior notice, during visits and attendance at any meeting or event; and for any such photograph or film to be used without payment of any consideration in printed, online (internet), video or other promotional or award-related communication, press release or article, without prior notice. Acceptance of an award constitutes the winner’s permission for CBIE to use the winner’s name and likeness for advertising and/or promotional purposes worldwide and in all forms of media in perpetuity without further compensation or authorization. CBIE reserves the right to change, without prior or any notice other than on the award webpage, the dates, application forms and requirements, selection process, criteria, and any other award feature and process where operational circumstances require such change. CBIE is not responsible for any inaccuracy in the contact details supplied by the student that may result in the inability of CBIE to contact that student. The nominee hereby authorizes third parties, such as universities, government or community sources to release information required for the award to CBIE and its respective representatives who need to know such information for purposes of selecting the winners. This information may include personal evaluations, verification that student information is correct and transcripts. Nominees agree that CBIE and its affiliates, and their officers, employees, agents and representatives, shall not be responsible for any losses, damages or injuries of any kind resulting from participation in the award or from winners’ acceptance, receipt, possession and/or use or misuse of any prize. All award prizes are non-negotiable. The decision of the selection panel with regard to eligibility, scoring and granting of Awards shall be final. The winners will be notified within 30 days of the date of the final selection. Notification will be sent to the student’s email address or telephone number, as appropriate and required. Nominators must obtain the consent of the nominees before submitting an application. Established in 1966, CBIE is a national, not-for-profit, non-governmental membership organization dedicated exclusively to international education. CBIE promotes the special interests of the international learner, both the foreign national studying in Canada and the Canadian studying abroad, through educational exchanges, scholarships, training awards and internships, technical assistance in education and other related services. CBIE is a unique organization in Canada. Among the major national organizations, only CBIE covers the spectrum of Canadian education, from K-12 to postgraduate, public and private sectors. Working closely with a membership of over 150 education providers nationwide, and with a network of strategic partners throughout Canada and around the globe, CBIE is ideally positioned to promote global learning by mobilizing expertise, knowledge, opportunity and leadership. In regards to the joint collaboration between CBIE and the Libyan Ministry of Higher Education and Scientific Research, CBIE managed the Libyan-North American Scholarship Program (LNASP) from January 2010 – September 2015, and most recently Phase 2 of the Program commenced in March 2016. With approximately 1,500 Libyan students currently on scholarship in the United States and nearly 1,000 in Canada, the goal of the Scholarship Program is to facilitate the studies of Libyan sponsored students in North America, allowing them to fulfill their academic objectives while addressing the needs of Libyan public institutions, academia, and society as a whole.